Kenneth (Ken) Berryhill is a native of Jackson, Tennessee. Ken began his career in radio broadcasting back in 1946, when he was just 16 years old. That career is still going strong today, broadcasting a show over WRVU in Nashville. In 1946, he was doing freelance work for various Memphis radio stations. In 1947, he became a part of the original staff for a new Memphis radio station, WDIA, that aired a variety of programs, including something that was then called "hillbilly" music. His first on-the-air assignment was with a Monday through Friday show called "Sons Of The Pioneers" that aired for 15 minutes. He later hosted a longer variety show during 1947 and 1948, and Ken remembers the very first song he aired back then. It was a tune on the King record label, a 78rpm by Grandpa Jones, who would become one of Ken's best friends. Ken told Jacque Hillman of the Jackson Sun in a June 2001 article that one of the people he worked with back then was the now legendary blues artist, B.B. King. From there, he started at Lambuth College and got work at WTJS in Jackson. He said in that June 2001 article that his first show, "College Corner" bombed. But he didn't let that deter him from asking the station manager to let him try his own mix of comedy, dumb jokes and sound effects. He loosened up what was then a "...staid station". Ken was quoted, "I did things my way. ... I didn't mind hiccuping or belching on the air." But broadcasting aside, he also was in a position to mentor Lambuth students, some making their way up to the third floor studios to learn the radio business with him. 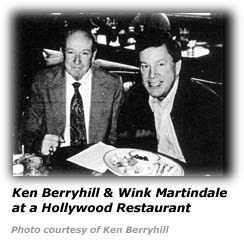 One person he influenced then was Wink Martindale, who credits Ken with starting him on his career. Wink told the Jackson Sun in that 2001 article that he tagged along with his sister and her date one night and got to see Ken's show in person that night. Wink was 14 at the time and thought he was in "hog heaven" and very impressed. Wink of course went on to fame as television emcee / game show host for such programs as "Tic-Tac-Dough", "Gambit" and "Trivial Pursuit". "Without question, he's the person who convinced me that radio and television was what I wanted to do with my life. ...Ken was the first personality DJ, before you even called them DJs. He's a funny guy who uses sound effects and funny voices." The article also mentions Vince Tapler of Jackson who worked with Ken at WTJS back then. He notes that "...every time Berryhill announced the time, he'd blow a duck call." He'd do a show on Saturday nights also then, playing the older records and had quite a few sponsors. Tapler also mentions again Ken's comedic tendencies when he relates that he'd interview people and make up foolish questions to ask during the interview. Mr. Tapler noted, "He was a comedian. He was never abrasive, and he had a very popular show." During 1951 and 1952, he was on WMAK in Nashville, and hosted a Monday through Friday one-hour nightly show called "Open House". Ken's show featured guest appearances by many of the stars of the era including Eddy Arnold and his manager then, Col. Tom Parker (who later managed Elvis Presley). Ken kept in close contact with Mr. Parker, even after he took over the reigns of managing Elvis' career. Remember that Elvis recorded quite a few country tunes early and throughout his career. And also recorded quite a few gospel tunes. One of Ken's roles was producing the Blackwood Brothers (the famed Gospel singing group) Television show. Elvis so loved the group that he wanted to be a part of the quartet. But we know how history evolved for him. Over the years, Ken got to know Elvis and his parents, Gladys and Vernon and has many such anecdotes related to Elvis. In fact, he's actually drawn up an outline for a book that has the working title "The Elvis I Knew", which would include many, up to now, unheard anecdotes about Elvis. As one might expect, Ken's career has brought him into contact with many of the stars in the musical entertainment industry, and not just always country music entertainers. It also gives him a different perspective on music than most of us might have, but in another way, shows how the music connects with our lives, too. For instance, George Jones and Tammy Wynette had a 1976-77 hit recording of "Near You". That tune was composed by a Nashville bandleader by the name of Francis Craig. Back in Ken's early broadcasting career at WMAK in Nashville, he got the opportunity to interview Mr. Craig and developed a friendship as time went by. Often, Ken would drop by the WSM studios (which were then in downtown Nashville) just to have a Coke and a chat with Mr. Craig. Even today, that friendship endures as Ken has had Mr. Craig's daughter, Donia Craig Dickerson on his show several times to talk about her father's career and also to promote a recent biography about him. After graduating from Central High School in Memphis, he began his college studies at Vanderbilt University in Nashville. Even during this time, he was able to continue his country music radio work. While at Vanderbilt University, Ken's love of radio continued to tug at him. Like any new college student (he had transferred from Lambuth College), he was worried how he would fare academically with the rest of his classmates. But perhaps unlike most of those students, Ken was already a veteran of licensed airwaves for three years. He had his own personal broadcast equipment, but he had to leave it back home with his parents, for he promised them he would study and avoid distractions. But as time went by, he felt the need to find a way to raise some funds as most students do. Ken found part-time employment with radio station WMAK in Nashville. Then, the station did their broadcasts from the basement of the original Maxwell House Hotel on Church Street. That turned into a regular 6:00pm to midnight shift, five days a week and occasionally on Saturday, too. The next school year, he came back with his broadcast equipment, which was enough to enable him to broadcast from his dormitory room at Cole Hall. How he did that was pretty interesting and perhaps showed a bit of his grit and determination. Since he couldn't be heard outside of the building, Ken, as he told Skip Anderson in a February 2001 article in the Vanderbilt Register, ran a wire out his window and around a quarter of the building's exterior. That gave him a broadcast signal radius of nearly a mile from the dorm. Word spread and he attracted a loyal, enthusiastic audience. The student paper Vanderbilt Hustler wrote in an October 12, 1951 article that listeners were able to win free records by identifying tunes that Ken was playing as part of the contests he had going on while on the air. But it also wasn't long before the school officials to interrupt those broadcasts. Ken was known then or billed as the "Voice of the Commodore" and school officials were concerned about the safety of his setup, mainly, a concern about lightning. He continued his efforts, and worked with a classmate, Tom Landess, who helped him with the broadcasts. He event went so far as to do his own broadcast of the final game of the 1951 World Series. That broadcast was aired several times by request of his listening audience and done of course without the written consent of Major League Baseball. Ken kept reaching and shared a vision he had for radio at Vanderbilt with Harvie Branscomb, who was Chancellor at the time. Ken felt the university could provide a campus radio station that would enable the university to not only broadcast entertainment, but Vanderbilt related news and events, and possibly even classes. Ken made an impact. Before he could see his vision bear fruit, he was drafted into the military service by the Army. However, around the same time, Rob Roy Purdy, professor of English and the chair of the committee formed to explore the feasibility of a campus radio station contacted Ken. When Ken came back two years later, the radio station was up and running. We learned from an article in The Jackson Sun in June 2001 that during his Vanderbilt days, "...he and his famous record pantomime act" were such a hit that he made it to the finals of the Ted Mack Amateur Hour show. He then ventured into television work at WSM-TV. One of the assignments he earned was as producer and director of the old "Tennessee Jamboree" show. This 'live' show aired nightly, Monday through Friday. In 1952, during his stint on the Tennessee Jamboree show, he was able to become acquainted with many of the era's country music greats and near-greats. One of those greats was the man known for "Candy Kisses", George Morgan. The years went by and fans as well as Ken wondered why George had never been elected into the Country Music Hall of Fame. Time went on and Ken got to know George's sister, Jeannette and her husband, Bill Copen, of Nashville, as well as George's brother, Bill. Mr. Copen played bass at one time in George's band. One of those conversations brought up the subject of whether they had heard if George were up for consideration. Ken then decided it was time to nominate George in 1998 and coincidental or not to Ken's efforts or perhaps Ken was the catalyst for action - George Morgan was elected to the Country Music Hall of Fame that year - 1998. Ken's work during this time gave him the chance to know and interview one of country music's most loved stars, Hank Williams, Sr. Later, he'd get to know the man who became the manager for Hank Williams, Jr., Merle Kilgore. More recently, he was part of the backstage audience when Hank Williams III made his debut on WSM's Grand Ole Opry. And still another Williams family member he's known is Hank's daughter, Jett Williams, who was born after Hank died. But let us get back to the discussion of his career. His career was interrupted when Uncle Sam drafted him into the Infantry during the Korean War. His assignments eventually took him to the Signal Corps where he managed an Armed Forces Radio Service station out of Fort Gordon, Georgia. He continued honing his talents as a disc jockey and of getting to play his favorite type of music - country. In 1954, Ken returned to civilian life. His next stop was in Memphis, at WMCT, a television station, where he was the producer and director of the popular "Rhodes Show", which featured the Rhodes brothers: Speck Rhodes, who later joined the Porter Wagoner show, Slim Rhodes and Dusty Rhodes. Those times evolved into lifelong friendships for them. The year of 1954 held another milestone for Ken, for that's when he married the former Mary Lea Morris of Ripley Tennessee in July. His broadcasting career took another turn. In 1957, he became manager of WMOX in Meridian, Mississippi. 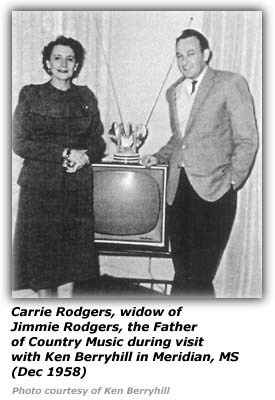 While there, he got to know and became lifelong friends of members of the Jimmie Rodgers (the Blue Yodeler himself, who many call the Father of Country Music), including Jimmie's widow, Carrie. When he arrived at WMOX at the age of 27, it was using a Rock format at the time, which was beginning to take hold in many places across the country. But Ken changed the format to more moderate pop music and mixed in "lots of country music", including a show that featured the music of their hometown legend, Jimmie Rodgers. Another task he took on was to work behind the scenes to restart the Jimmie Rodgers day that Hank Snow and Ernest Tubb had originally started to honor their inspiration along with Jimmie's widow, Carrie. But it took some effort as their were hard feelings on both fronts he had to deal with. The artists and performers in Nashville who felt they weren't being treated fairly or respectful and the merchants who seemed reluctant. But Ken was a member of both the Junior Chamber of Commerce (Jaycees) and the Meridian Retail Merchant's Association and smoothed things over and realize they were passing up an opportunity for the town to generate extra revenue each year from such an event, which meant they would also benefit. His efforts included going to Nashville to meet with Ernest Tubb and Hank Snow as well as Mrs. Carrie Rodgers. In the end, those efforts paid off, for the Jimmie Rodgers Day started again and continues to this day, turning into a weeklong celebration. During his time in Meridian, he was able to meet with Mrs. Rodgers several times during her frequent visits to Meridian from their home in Texas. She'd often stop by the home of Ken and his wife Mary and consented to a series of taped interviews with Ken about her life with Jimmie. Ken still has those tapes - a total of about two hours. Ken relates one of those visits where he drove Carrie out to see the statue of Jimmie one night and saw her just gaze into Jimmie's eyes, a moment that has stayed with him. She mentioned to him a fact that is borne out by Nolan Porterfield's classic tome on Jimmie's life - that they were never out of debt, in spite of Jimmie's seeming success. Ken also became acquainted with two of Jimmie's sister-in-laws. One was Mrs. Pearl Rodgers and the other Mrs. Elsie McWilliams, who was Carrie's sister. Elsie was a pianist and songwriter in her own right and shared songwriting credit with Jimmie on several tunes. On others, Jimmie would receive the credit on record, music sheets and royalties. But Elsie did that to help her sister and brother-in-law knowing their financial situation due to Jimmie's spending habits and also his ongoing medical battle with TB, which he memorialized in several of his songs. Ken was able to tape several sessions with Elsie that not only included an interview, but of her playing and singing many of the songs, a treasure to say the least. Ken then moved from WMOX to become manager at WNAG in Grenada, Mississippi. At WNAG, Ken drew on the roots of his family's musical heritage a bit, for his dad was a fiddler and Ken had his own affinity for the old time country fiddling, and organized the Fiddler's Contest for the State of Mississippi. The event was registered with and recognized by the state and the annual affair drew the state's best fiddlers from around the state. This affair was during the early 1960s. The BMI Newsletter (No. 217, January 1961) makes mention of WNAG's "Olde Tyme Fiddlers' Contest". That year, they setup 200 chairs at a local auditorium and offered modest prizes for the contestants. It seems that this station's turn to a bit of simplicity in the modern era struck a chord locally. Entries were received from the four surrounding counties and when the night came, over 500 showed up, double the seating capacity! Local merchants were generous in their support of the event, both monetary and products and was always free to the public. But Ken always seems to be thinking ahead and also of the fans. Not only was the show free for the fans who attended the show, but Ken made the show available on a tape-delayed basis to the surrounding states of Mississippi, Arkansas and Tennessee. In addition, the station sent an interview that was made during the event to the NBC network to use on their broadcast celebrating the Fifth Anniversary of the "Monitor" show. 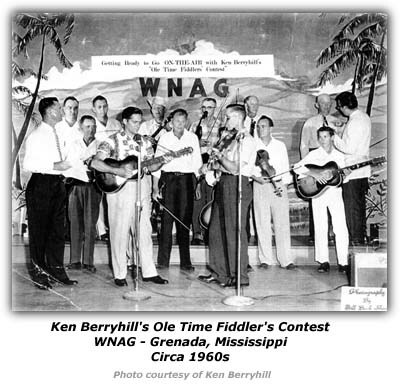 That interview, by Ken Berryhill with fiddler, Jim G. Martin, was aired to nearly the entire country on Sunday night June 12, 1961 between 7:30 and 8:00. A March 23, 1962 press release from WNAG notes that Billy Mitchell, a Tupelo policeman won the first place award for the second straight year in the contest, which then was called the "Fourth Annual Mississippi Ole Time Fiddlers' Contest". The tunes he played to earn the title included "Black Mountain Rag", "Katy Hill" and "Orange Blossom Special". Twenty contestants vied for honors. Al Hobson of Lexington finished runner-up and Marvis Ferguson of Grenada finished third. But this annual event wasn't the only time fans got to hear the good old country fiddling. Ken arranged to have the local fiddlers take part in a weekly 15-minute show the year round, while Ken acted the part of emcee for the show. Keep in mind this was during the time when rock and roll was making its head long drive for attention. They conducted a survey at the Grenada County Fair one year and the show, Fiddlin' Time, ranked as one of the Top Five shows for the station. And we'd be remiss if we didn't tell you how we came to learn of Ken. For the picture we see of him seemingly play the fiddle was a publicity photo he had posed for - for a scrapbook publication at the time that was supposed to mention the fiddling contest, but omitted that part. Ken told us about that and you can read that separately in the listing we have for him under the "Artists" section. He left the broadcasting arena for a time beginning in 1959 where he took a position as Professor of English at the University of Memphis, where he stayed for five years. Even during that time, he managed to maintain close ties to the music he enjoyed, keeping in touch with the long-standing friendships with among the stars of country music, broadcasting local programs of country music. In addition, he also wrote two newspaper columns where he reviewed the latest new country music records of the day. He also did a program that was syndicated during this time, the "Ken Hill from Nashville" radio interview show. 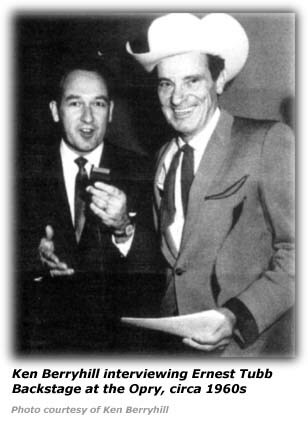 That classic show was made up of interviews of the current stars of country music then, while backstage "live" at WSM's Grand Ole Opry in the mid-1960s when it was at the Ryman Auditorium, an idea that carries on even today with an interview show 'backstage' at the Opry prior to each televised broadcast of the Opry. 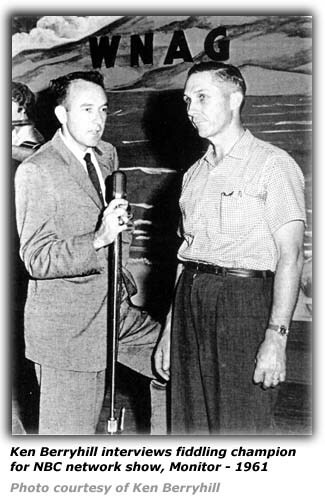 Ken still has these interviews that he did with such stars as Ernest Tubb, Hank Snow, Tex Ritter, Billy Walker, Curley Fox, Speck Rhodes, Earl Scruggs, Lester Flatt, George Morgan, Stringbean, Lightnin' Chance and numerous others. Those shows were taped by Ken and saved for future generations to be able to hear many of the now deceased stars that Ken interviewed. Those interviews are a true collector's item in this day and age. You can imagine that organizations such as the Country Music Foundation and major universities would be interested in having such a collection. During this time, Ken also kept busy with his writing talents. In the late 1950s and early 1960s, he edited and published a small magazine called "Old Record Shop". It featured articles about both country and pop artists and their recordings. Stars such as Fred Rose, Hank Williams and Ernest Tubb were some of the many featured artists in that publication. After Memphis, Ken found himself in Englewood, Florida, where he changed WENG's big-band format to country music. During this stint, he began a show that is still aired, "Ken's Country Classics" that was heard worldwide over short-wave. 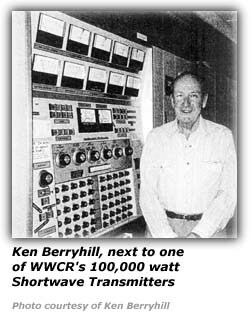 That show is still heard over Nashville's short-wave station WWCR (World Wide Country Radio). By now you've seen some hints that he was a bit more of a broadcaster and seen hints of his comedic leanings. His career did also include appearances onstage, radio and television as a country comedian. 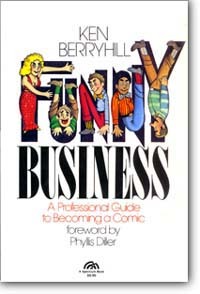 In fact, he wrote a book about that experience that was published in 1985 by Prentice-Hall, "Funny Business: A professional Guide To Becoming a Comic". That book can still be purchased even today over such online outlets as Amazon.com. He continues to honor the heritage of country music comedy in his current radio work, often including comedy routines from Jerry Clower, Mike Snider, Minnie Pearl (who attended the same church in Nashville that Ken did, West End Methodist) and Rod Brasfield. The book was an outgrowth of a course he taught at Memphis State University, where he taught students how to be comedians/comediennes. Recall earlier he appeared on Ted Mack's Amateur Hour. In one chapter in his book, he is describing various types of comedy and provides a personal note in talking of the Pantomimist (Recordings). He wrote that when he was first starting out and wanted to win an amateur show, he'd draw on his old record pantomime act. We read earlier of Ken's relationship with the Jimmie Rodgers' family when he was working in Meridian, Mississippi. He found his life crossing paths with the family again in the early 1990s when he met Jimmie Dale Court, the son of Jimmie Rodgers' daughter, Anita. Their relationship over time resulted in a meeting in Nashville where Jimmie signed a contract with "Coach" Ken Berryhill to be his personal manager. Perhaps to preserve the legend, he never used the name Jimmie Rodgers as part of his stage name. Jimmie Dale Court passed away around 1996 at the age of 45. As we move into the new century, Ken is still connected to the Jimmie Rodgers family legacy. Rick McWilliams, the grandson of Elsie McWilliams, lives in Meridian and is very active in the annual Jimmie Rodgers Festival. The Rodgers and McWilliams families also have an annual event, "Reunion On The Mountain" in northwest Georgia. As one might expect, there is plenty of picking and singing at the event. Ken and his wife are special guests and attend this reunion and Ken always takes a tape or two back to Nashville to let fans in on the music and events that occurred. Even today, Ken continues his love and passion for country music and broadcasting. Life has gone a long circle for Ken, for now he's back at Vanderbilt University. Music fans around the world can now listen to Ken's broadcasts over WRVU (via Webcasts) and also via short wave radio. A far cry from those early days of stringing wire from his dormitory room. Ken features both contemporary and classic country tunes on his shows and manages to work in segments of the early interviews made in the early 1960s from his collection as part of the shows, allowing us to be a part of that era in a sense. Ken may not fit your typical profile of a broadcaster on a student radio station, but Skip Anderson tells us that he had earned the respect of the students that were a part of the station according to the general manager and a senior in the College of Arts & Sciences then, Jeremy Mills. 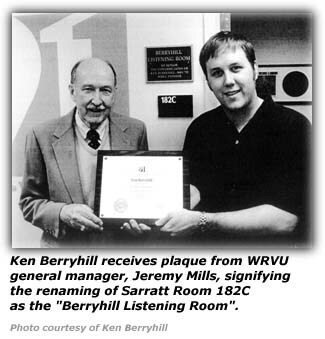 He and the staff renamed the station's listening room in honor of Ken Berryhill. It caught Ken completely by surprise. He mentions he thought he was getting axed when he got called into a meeting with Jeremy, sort of like being 'voted off the air, like they did on a current television show 'Survivor'. Jeremy replied to Ken, "No ... we've permanently voted you onto this island." In Mr. Anderson's article in 2001, it tells us that Ken had been back at the station for then five years and relates that Mr. Berryhill has been "...described as the Father of Vanderbilt Radio." "I think that might be an overstatement. All I did was strike the match." We should all be so lucky to strike such a match in life. Fans can still enjoy hearing the former "The Voice of the Commodore" who's now known as "The World's Oldest-Living Disc Jockey" broadcast every Thursday from noon to 2:00pm (that's Central Standard Time) doing "Ken's Country Classics" over WRVU, which can be found at www.wrvu.org. 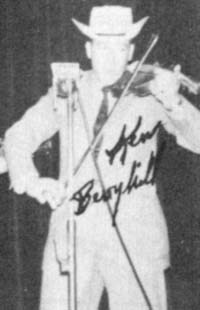 Ken Berryhill - Hillbilly-music.com wishes to express its appreciation to Mr. Berryhill for providing us with the materials and photos from his career for us to work with to develop this biographical sketch as well as the time given us via email correspondence and phone conversation.